Bathtub Refinishing 101 - the Process from Start to Finish! When you're looking for the most cost-effective way to update the look of your home, consider refinishing your perfectly good bathtubs, sinks, countertops, and showers - instead of replacing them. There is no need to deal with the mess and chaos for days on end of tearing out plumbing, ripping up floors, and damaging walls to replace bathtubs, sinks, bathroom wall tile and countertops, or even kitchen countertops that are in good working order just because you want to update the color scheme or because they have become stained, scratched, cracked, or otherwise damaged. You can update the entire look of your bathroom or kitchen just by having the items in them refinished so that they coordinate with your new décor - in a fraction of the time it would take to replace these items ... and at a fraction of the cost of replacing them. 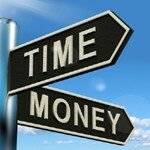 THAT'S why refinishing is THE time-and-money saving alternative to replacement . You don't really want to deal with this, do you? Unless you're gutting your bathroom down to the studs, there's no need to replace your bathtub, even if it IS old and ugly. That's why refinishing is for! You can buy a brand new steel bathtub for the same cost as refinishing your existing tub - BUT - you can't replace the old one for the same cost as having it refinished! Why? Because the most expensive part of replacing a bathtub is definitely not the cost of the new tub. In fact, most of the expense of replacement is initially hidden. The most expensive part of tub replacement begins with taking out the old tub, because in the process of doing that, parts of the bathroom tile have to be removed, which means you will need to hire a tilesetter to replace those tiles .. or can you even find tiles like that anymore? In addition to tearing up the tile, the hardware for the new tub may not fit the old plumbing fixtures, so now you'll need to hire a plumber. And on and on it can go. Remember, bathrooms are built around tubs. Can you even get it out of the bathroom or through the front door at all? If not, it will need to be cut in half. Even if you can maneuver it through the house to the outside, you'll still need to dispose of it properly. Add up the cost of the new tub, a tilesetter, a plumber, and a host of other "unknowns" you may run into, and that simple idea of replacing your tub could end up costing thousands of dollars - and that's what makes refinishing more cost-effective. Above all, remember this: A like-new bathtub appearance cannot be achieved with Do-It-Yourself products. Only a professional refinisher has access to the high-tech, durable coatings that are required to give a bathtub its shiny new appearance. More importantly, only a seasoned, professional refinisher has the tools and skill to apply the surface correctly the first time, every time. Read our reviews and testimonials. Hear what others before you have said about our work - and then decide. We aren't the cheapest or most expensive out there, but we are the best in what we do, guaranteed! Successful refinishing greatly depends on how well the surface is prepared before the actual refinishing takes place, and preparation steps differ depending on the type of surface being refinished (porcelain vs. cultured marble vs. fiberglass). All surfaces must be thoroughly cleaned and repaired first as the foundational step. On porcelain, we use an acid to etch the surface. On cultured marble and fiberglass, we use a wet/dry sandpaper to "rough up" the surface so our product has something to adhere to. All areas not being refinished are completely protected by drop cloths, plastic, and masking paper. There is SO much labor and time involved in prepping a bathroom or kitchen to ensure there is no overspray, and that fumes and dust particles are kept to a minimum while spraying. All the areas not being sprayed are 'papered off' for protection, and a ventilation exhaust system is used to control, vent, and filter out and away the spray and fumes. "Hi Debbie ... another beautiful refinishing job! Jim puts so much prep into it - here's a picture of it. I think the part you don’t see is as beautiful as the finished job. Thanks so much!" Bathtub refinishing is known by several names: bathtub resurfacing, bathtub re-glazing, bathtub re-enameling, and even bathtub refurbishing. They all mean the same thing. 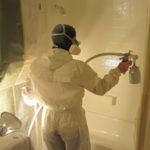 Bathtub refinishing is a "sprayed-on" process that can make a worn, damaged bathtub look like new again. This like-new appearance cannot be achieved with Do-It-Yourself products. Only a professional refinisher has access to the high-tech, durable coatings that are required to give a bathtub its shiny new appearance. More importantly, only a seasoned, professional refinisher has the tools and skill to apply the surface correctly the first time, every time. Refinishing is not installing a liner on top of your existing bathtub. It is a "sprayed-on" process. The coating is applied with an HVLP gun (spray gun), which can only be performed successfully by a professional refinisher. The picture above is Jim spraying a bathtub and the tile walls of a tub surround. Notice how he has masked off all the areas around him in order to protect the areas not being sprayed. After the surface is properly prepared, a primer coat is applied. This primer has a powerful bonding agent that shares common properties with the top coat which allows it to attach to the tub surface. The entire surface will then get a minimum of four top coats. The coating will dry to the touch in 24 hours, and the tub or sink will be ready to use 48 hours after refinishing, but it will take a full 30 days for the process to totally "cure." What you end up with looks, feels, and cleans like brand new, and is extremely easy to keep clean. Cleaning a refinished surface usually takes no more than a washcloth and a very mild (no bleach or abrasives necessary) liquid or foam cleaner. Jim has mastered the art of refinishing and continues to be meticulous in every step of his work - truly an artist in refinishing skills!